The ConceptDraw DIAGRAM is a professional software for the great looking graphs and charts designing. Many vector symbols, samples and templates, created by designers, allow you to instantly start draw any type charts or graphs. The main idea of the data graphical representation is a chart, where data is represented by bars in a bar chart, lines in a line chart, or slices in a pie chart. Other side of the charts is a flow chart, organization chart or other representation of the structural or flow data. Charts provide faster readiness than the raw data, that they are made of. They can be created by hand or using the ConceptDraw DIAGRAM software. Sample 1. Document flow chart sample. 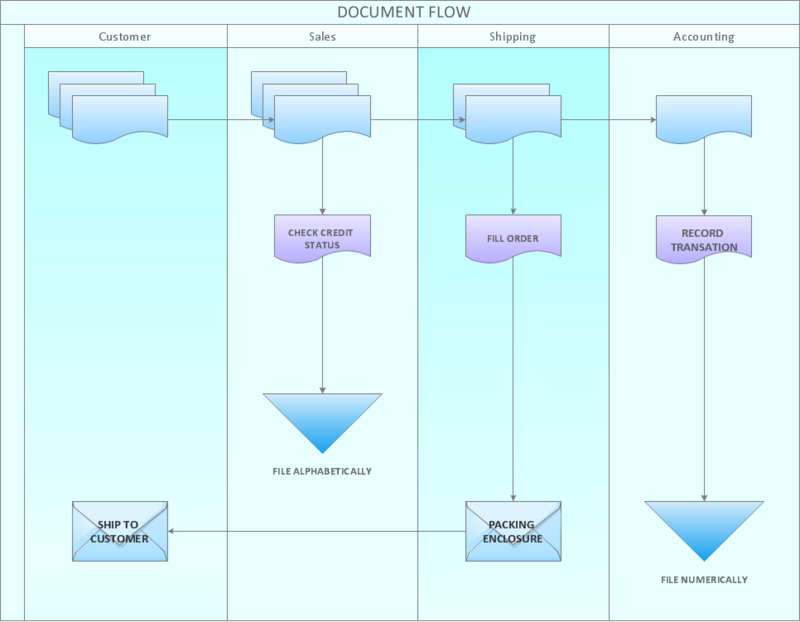 This example of business process cross-functional flow chart depicts document flow steps. Use ConceptDraw DIAGRAM software for quick and easy creating your own cross-functional flow charts. Use ConceptDraw DIAGRAM v12 diagramming and business graphics software for drawing your own PM life cycle flow charts.